Back in 2012, the Australian government announced $20 million in funding to support the local game development industry. The plan was to spend $10m over 2012-2013 and the other $10m over 2014-2015. 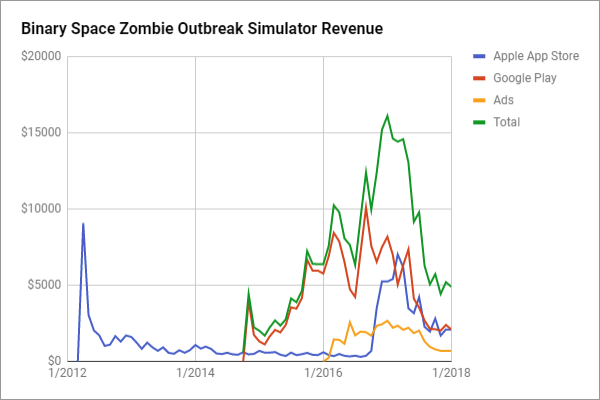 In 2013 I decided to apply for funding from the first round, to make an Android version of Zombie Outbreak Simulator. My application was successful (thanks Screen Australia!) and I received $30k of funding just before the end of 2013. I hired two people to help me, and we released ZOS for Android in November 2014. However, also in late 2013 there was a change of government, and at the new government’s first budget in May 2014 they decided to cut the remaining $10m left in the games fund. I still received my funding that had already been committed, but no new games could apply for funding. As I mentioned, back in 2013-2014 the government gave me $30k to make ZOS for Android. Was this a good deal for Australia? Firstly, out of the $30k I received, $21k went straight back into the Australian economy to Australian employees and contractors. I hired two people (creating two jobs), and two contractors (marketing and legal advice). The government received some of their money straight back from me in income tax on those two employees, and the contractors would have paid their own tax too. However the other $9k did go overseas to Facebook in Ireland, spent on Facebook ads for the game when it was released. 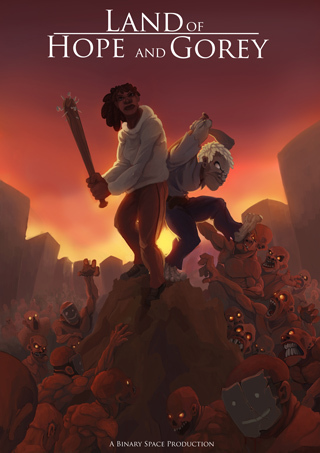 Zombie Outbreak Simulator was first released on iOS way back in 2012. The Android version was based on the iOS version, but much improved with the help of the funding I received. Across both iOS and Android, ZOS has recently reached over two million downloads, with over 1.5 million of those on Android. ZOS on Android alone has earned $185k. 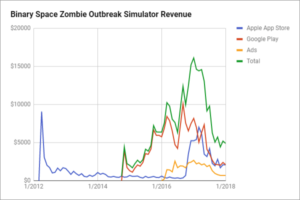 In October 2016 I released an update to ZOS for iOS which ported across all of the new stuff built for ZOS for Android, resulting in a marked increase in sales. Since then ZOS for iOS has earned $55k. In March 2016 I also added rewarded video ads to the game, which have earned an extra $40k. All up, that’s $280k that the game has earned so far, off the initial funding of $30k. Almost a 10x return! Was $30k of funding all it took to get this result? No. ZOS for Android was based on games that Jay and I had been working on since 2009. Before ZOS for Android I’d put in over 2,500 hours of work and made a fantastic profit of $120, and Jay had put in over 1,800 hours too. I did another 700 hours of work on ZOS for Android and only paid myself $700 out of the funding I’d received. I didn’t just ask the government for a handout, I put a lot of my own time, effort and money into it too. Would I have made ZOS for Android anyway, even without the funding? Probably – I had wanted to for some time, since players kept asking for it. However it definitely wouldn’t have been as good. The approx 10x increase in sales on iOS when I ported the Android features over to iOS shows how much better the Android version was – all due to the features I was able to afford to build because of the funding. So could the industry fund its own game development? Yes, and the industry has still been growing despite the lack of government support. However it could grow faster with support. Although the federal government isn’t offering any support, what about state governments? Film Victoria has a very strong program of support for game developers. As a result 40% of Australian game developers are in Victoria, even though Victoria has 25% of the population of Australia. The South Australian government recently announced a $2m package of support for game development. However Binary Space is based in Perth, Western Australia. In 2016 the WA Labor party offered support for the startup and gaming sector while seeking to be elected, but once elected their new industries fund announced in 2017 failed to mention game development. Screenwest is currently undertaking a review of screen industry funding, even though they have always had a policy of refusing funding to “computer games for entertainment purposes only”. Still, I know that Let’s Make Games and other local game developers have been talking with the government and Screenwest for some time about the merits of the games industry. So I’m hopeful that in time we’ll receive some recognition and support from our state government. And any chance of porting over the features of ZOS like soldiers, bombs, helicopters etc over to PC ZOS/C3O? In fact any plans at all to work on PC ZOS/C3O? Any plans to create a proper version and upload it to Steam so fans like myself can buy it? Or is it all hands on deck for Land of Hope and Gorey?